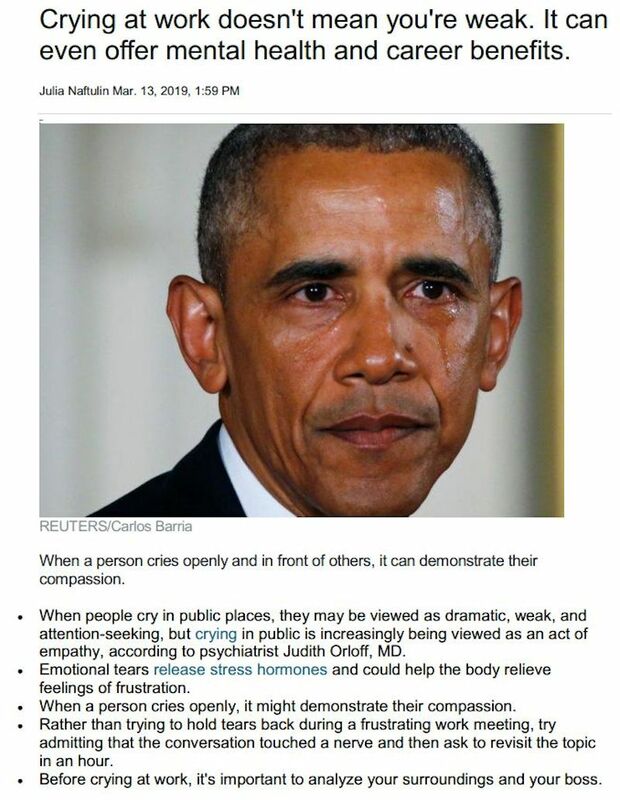 For over twenty years as physician, I’ve witnessed, time and again, the healing power of tears. Tears are your body’s release valve for stress, sadness, grief, anxiety, and frustration. Also, you can have tears of joy, say when a child is born or tears of relief when a difficulty has passed. In my own life, I am grateful when I can cry. It feels cleansing, a way to purge pent up emotions so they don’t lodge in my body as stress symptoms such as fatigue or pain. 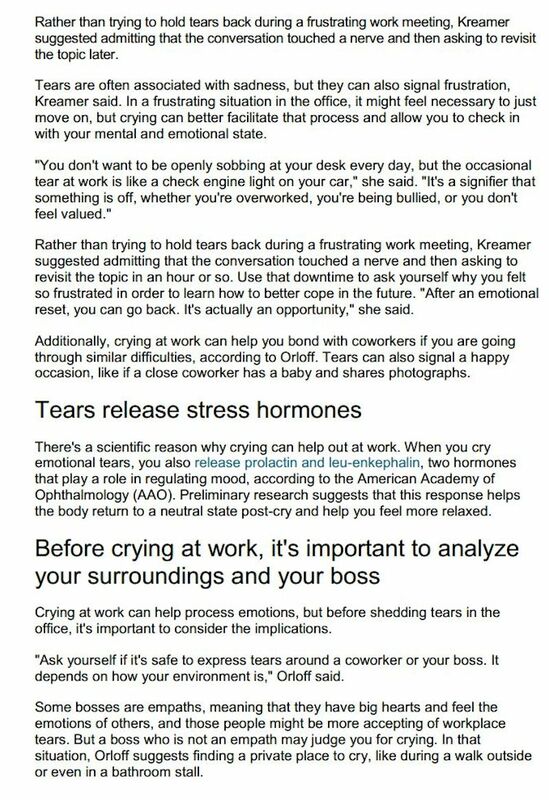 To stay healthy and release stress, I encourage my patients to cry. For both men and women, tears are a sign of courage, strength, and authenticity. 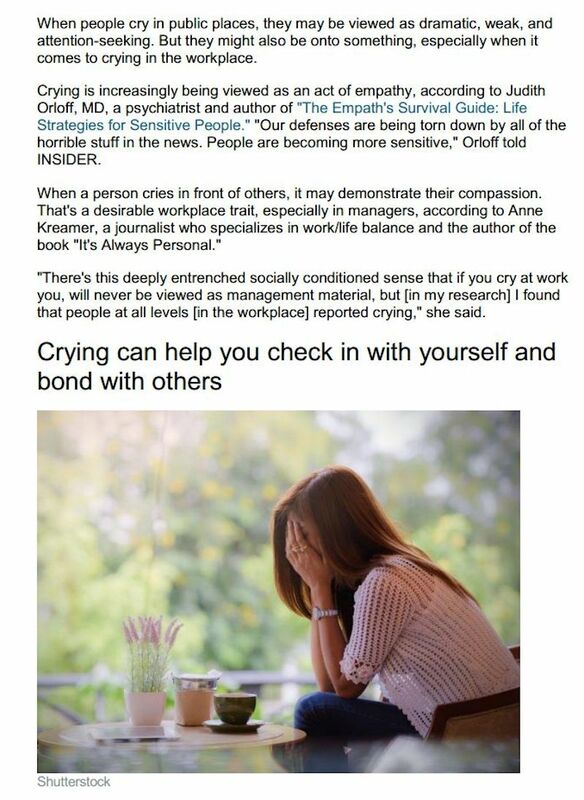 In my books “The Empath’s Survival Guide” and “Emotional Freedom,” I discuss the numerous health benefits of tears. Like the ocean, tears are salt water. Protectively they lubricate your eyes, remove irritants, reduce stress hormones, and they contain antibodies that fight pathogenic microbes. Our bodies produce three kinds of tears: reflex, continuous, and emotional. Each kind has different healing roles. For instance, reflex tears allow your eyes to clear out noxious particles when they’re irritated by smoke or exhaust. The second kind, continuous tears, are produced regularly to keep our eyes lubricated–these contain a chemical called “lysozyme” which functions as an anti-bacterial and protects our eyes from infection. Tears also travel to the nose through the tear duct to keep the nose moist and bacteria free. Typically, after crying, our breathing, and heart rate decrease, and we enter into a calmer biological and emotional state.